Before you even set foot on snow, get your toddler stomping about indoors on the carpet. They can get a feel for how the boots and skis feel on their feet in a warm, familiar environment so, by the time your holiday comes around – and you add bulky clothing, cold and snow into the mix – they won’t feel so overwhelmed. Get down on all fours and gently push the bindings forward so they feel the sensation of sliding. Don’t force anything. Make it a game, and watch as they learn to balance on their own simply through play. Don’t be afraid to incorporate helmet, goggles and gloves too! Choose a sunny and (ideally) warm day. Let them shuffle around on the flat and pull them around with your ski poles. As soon as you feel they are ready, move onto the nursery slope – just the bottom section to begin with, with a flat run-out, so whatever happens, they will stop! 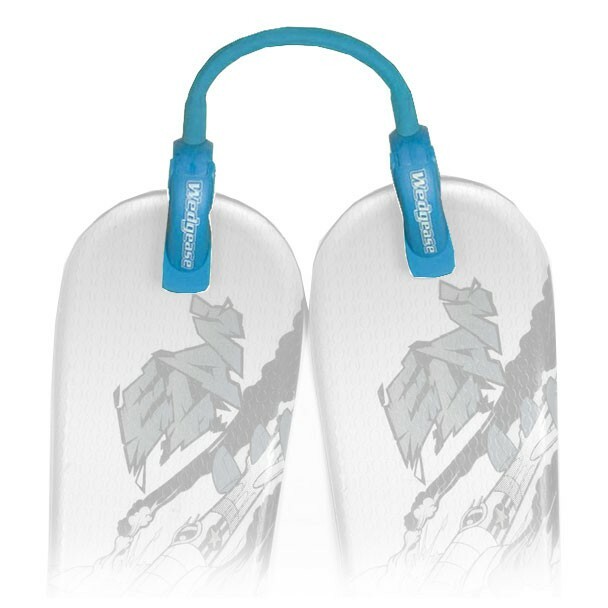 Let them slide independently as you run or ski alongside, providing words of encouragement. You can progress higher up the slope as their confidence – and balancing skills – grow. Don’t wear them out; have a couple of goes, then head inside for a hot chocolate. Don’t rush their progression. The most important thing your toddler is learning is to associate the whole rigmarole of skiing with fun. The only real skill they will be developing in these early stages is balance. As they begin naturally to start steering the skis, you can introduce the snowplough – but this may not happen during their first season on snow. The key is about hours spent sliding on snow to build up their confidence and enjoyment; the rest will follow. Rather than hold them and ski with them between your legs (they’ll go limp and rely on you to hold them up), it’s best to let kids slide independently. As you progress onto gentle greens/blues, a harness with a leash works well, letting them ski ahead of you while you snowplough behind. You can also ski next to them holding a ski pole sideways across you, while they hold the handle. Another useful bit of training kit is a bungee that clamps onto the ski tips to keep them from crossing or spreading too far apart – useful when snowploughing. DON’T bother with ski poles (for now) – they just get in the way and cause a distraction. DO focus on fun. 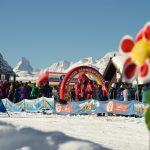 Play ‘follow the leader’, chase each other with snowballs, pretend to be different animals… they’ll learn fastest by accumulating ski skills indirectly, purely by having fun. Don’t be afraid to try to tiny resort you’ve never heard of, after all, you won’t need miles of piste, writes mum-of-one Flore Dussey. A few miles down the valley from Switzerland’s most famous mountain resort is one of its least famous. En route to mighty Zermatt lies modest Grächen, which, it turns out, is just as much of a paradise… as long as you have little kids in tow. Last winter, my daughter and I gave it a try. The village, at 1620m, is partly pedestrianised, with a free ski bus, covered parking and accommodation at various budgets. 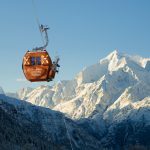 The ski pass is cheaper if you stay locally (free for under sixes, discounted for under-15s, less so for under 19s; there are also nursery slope-only passes). There’s a heated ski and boot depot, a village playground, an ice-rink and sledging. So far so sensible, but it’s when you step into the gondola – reached by a ramp, ideal for pushchairs – that it gets more interesting. The eight-man bubbles are decorated with pictures of fairy tales, and as the doors close, the story of Hansel and Gretel or Snow White (in Swiss-German), comes through the speakers. 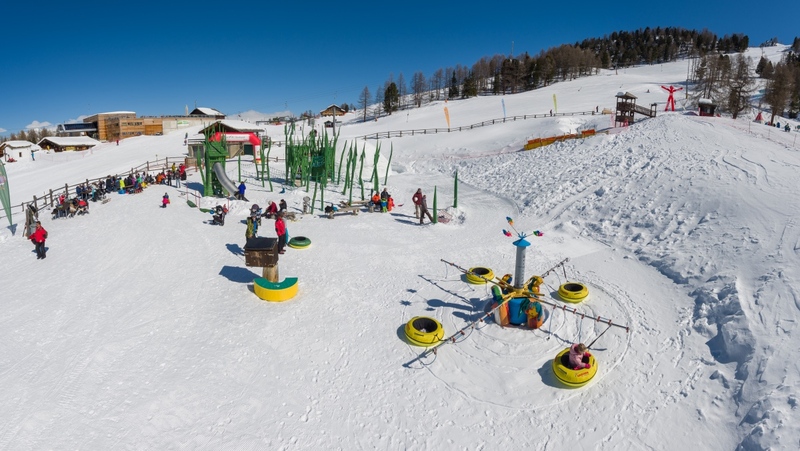 Up on Hannigalp (2114m) are four magic carpets, two kids’ tows and any number of kid-friendly obstacles. For older ones there’s a ski movie run, a ‘family fun slope’, jumps, boxes and a tunnel. 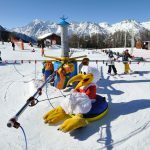 There’s a playground and carousel for pre-ski kids, plus a kindergarten in the Hannigalp restaurant. Grächenhas 42km of runs (9km ofwhich are easy). And the icing on the cake? You can see the Matterhorn. Have a look at my Hobbledehoo Harness. Designed to take from a 1 year old on the slopes. Developed by me and my now red run skiiers at 5 and 7 years old!